Your guests will appreciate these unique and practical Elegant Hearts Letter Opener wedding favors . The perfect addition to your elegant event, each of these Elegant Hearts Letter Opener wedding favors have a stylish silver resin double heart design is accented with a pearlized silver epoxy finish and attached to metal opener. Best of all they are ready for gift giving, they come packaged in an elegant black gift box with velvet lining wrapped with an organza ribbon, and double heart shaped thank you tag. 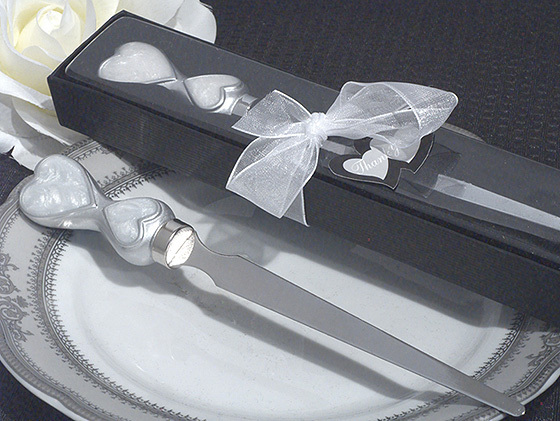 These Elegant Hearts Letter Opener wedding favors will surely keep the wedding memories open. Each favour measures 6″ long. Buy this now.